When Professor Lily Herman ’16 was in high school, her English teacher told her that she was a terrible writer. Clearly, they didn’t know who they were talking to. As a 2016 Wesleyan graduate, Herman is taking the journalism and digital world by storm. Working as a contributing editor at Refinery29, she writes a mix of opinion work, columns, and original reporting. She founded Rogue Sunday, a digital strategy and marketing firm, and has been published in Teen Vogue, Allure, and more. Herman also served as the University’s Fall 2018 Koeppel Fellow in Journalism and is a member of the Patricelli Center for Social Entrepreneurship Advisory Board. Oh, and one more thing: Herman was named one of Glamour Magazine’s “College Women of the Year” in 2015 for her work as the co-founder of a student-run, college access organization called The Prospect while she was a student at Wesleyan. 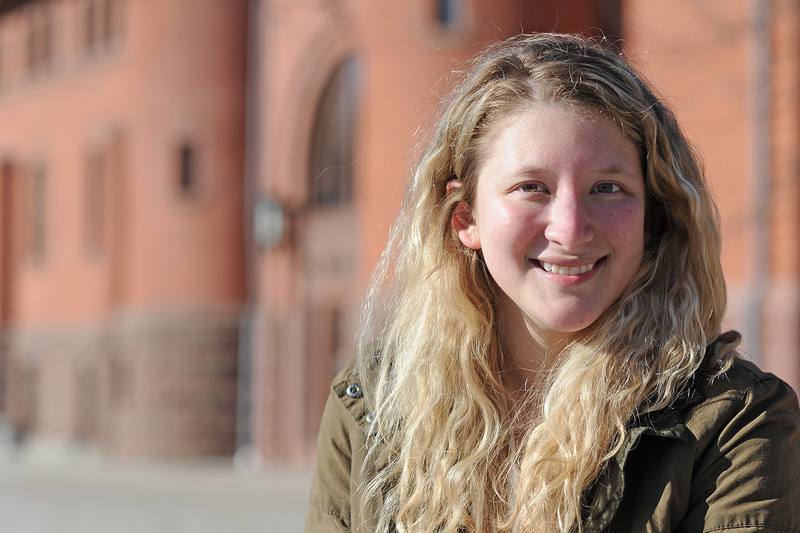 The Argus recently caught up with Herman via email to talk about her time as a Wesleyan student, her favorite books, and her life in New York City. The Argus: What’s on your bookshelf? What have you been reading lately? I try to skip around a little bit in my reading, but I’m mostly a nonfiction reader. Currently on the list: I’m working through Michelle Obama’s “Becoming” like everyone else in America, Brittney Cooper’s “Eloquent Rage,” Nicole Chung’s “All You Can Ever Know,” and Morgan Jerkins’ “This Will Be My Undoing.” Late last year I also read Soraya Chemaly’s “Rage Becomes Her” and Rebecca Traister’s “Good and Mad” back to back; they really complement one another. Because of the work I do writing commentary on politics and its intersection with feminism and other societal and cultural phenomena, it’s important for me to constantly understand where national and international discourse is and what other people in the space are thinking about. And in addition to all of that, half of my life is spent reading Twitter and email newsletters. And adjacent to reading, I’m a big podcast listener. A: Are you reading anything for your academic life? LH: Yes, always. I’ve found, however, that differs a little bit with digital media from other areas of study is that because digital media literally changes daily (and sometimes hourly), often the typical academic process (research, journal review, publication, etc.) doesn’t keep up with where the digital media world is at now; there are many cases where academic discourse can be years behind. Thus, I spend a ton of time reading on the internet—unsurprisingly, many of the best media critics and media culture writers just publish their stuff directly to the web, either through more traditional trade or mainstream publications or on content creation platforms like Medium. For example, this week I’m sending my students some supplemental reading surrounding a piece by Trish Bendix titled “Does LGBT Media Have A Future?” Bendix was the former editor-in-chief of AfterEllen.com and was laid off from her position as managing editor of the ground-breaking LGBTQ+ publication INTO this month along with its entire editorial and social media team. Ironically, her piece was published on BuzzFeed the day that BuzzFeed laid off 43 staffers (the first of three scheduled layoff days), including all but one member of its dedicated LGBTQ+ content team. A: What is your favorite novel you’ve read in the past year? LH: I don’t read fiction too much, but I finally finished Celeste Ng’s “Little Fires Everywhere” on my plane ride home for the holidays. She’s a magical writer, and since I was the last of my friends to read it, I think I had a conversation with pretty much everyone about it. A: Tell us more about the class you’re teaching this spring, “Digital Media in the Late 2010s.” What inspired the coursework in this class? LH: The course functions as a hybrid of more traditional social science and writing classes, and there are also some other elements that students don’t often get in other courses; for example, this semester there are five Wesleyan alumni guest-lecturing, including Nick Quah ’12, one of the most widely-read podcast industry experts in the country, and Glenn Cantave ’15, who runs an activism organization called Movers and Shakers NYC that uses virtual and augmented reality to promote education and change. Other speakers are Ella Dawson ’14, Zach Schonfeld ’13, and Rajaa Elidrissi ’16. Additionally, the class features a professional development component so that students can learn more about the ins and outs of working in a digital creative career more generally. I taught this class in the fall as well, and I’m excited to teach it again! A: How has your experience being a professor at Wesleyan differed from your experience as a student at Wesleyan? LH: As a student, you’re sort of engulfed in your own world and whatever you prioritize; there are entire communities and niches on campus you don’t look into or explore. In working with students, I get to see into many different parts of campus that I had no idea about when I was here or that just didn’t exist during my time on campus. And of course, one strange thing is being part of the various faculty Listservs—those can be unintentionally humorous sometimes. A: How did you become interested in journalism? LH: Journalism wasn’t even on my radar until I entered college. No one in my family is a journalist or has worked in media or any media-adjacent field, and a high school English teacher told me I was a terrible writer. I’ve also always done very poorly with unexamined rigidity, and more traditional journalism just didn’t seem like a good fit for me. As a prefrosh, though, I loved reading Wesleying, which at the time was helmed by Zach Schonfeld and a group of incredible writers and editors who were breaking huge stories on campus that were gaining local and national attention. They also maintained a hilarious Twitter account. My mom told me to try writing for Wesleying for at least a semester (she loved it too), so despite my reservations about my own writing, I showed up to the fall recruitment meeting and the rest is history. And now, two former Wesleying editors—Zach and the aforementioned Nick Quah—are talking to my students this semester. A: Can you tell us a little bit about your current career, as well as how you found your digital strategy and marketing firm, Rogue Sunday? LH: I dislike structured office environments and freelanced full-time on top of going to school at Wesleyan full-time, so after working exactly one full-time office job after graduation for nine months (in addition to still freelancing), I decided to go back to working for myself. In addition to writing for a number of publications and working on other editorial projects for clients, I started a digital strategy and marketing firm called Rogue Sunday mostly due to the need for more help. You can only scale so much as one person, so it made sense to bring a team on. A: What’s your favorite memory from being a student at Wesleyan? LH: Like a lot of people, I have a ton of interesting memories from Wesleyan ranging from absolutely mundane to borderline ridiculous (and probably more than a few I shouldn’t tell now being faculty and all). One of my crowning achievements was the day Ed Thorndike ’89 from WesWings recognized me from Twitter when I came in for dinner. It was because I tweeted obsessively and obnoxiously about obscure winter sports during the 2014 Olympics. I also remember the one time my frosh year that the Wesleying staff tried to have an IRL party. It turned into a bunch of internet nerds staring at each other and nodding silently a lot and talking about memes. And because most people had weird handles unrelated to their actual names, you had to introduce yourself by your Wesleying name. A: Are you writing anything right now? If so, what? LH: Yes, I’ve always got a lot of things in the works. I’m upping my writing for sites I’ve traditionally written for (like Refinery29) as well as working on some bigger long-term writing projects, mostly dealing with my bread ‘n’ butter subject matter of the intersection of politics and women. I’m also starting to get back into a cycle of pitching more frequently to publications I haven’t written for in the past, which is always an exciting challenge. A: What do you like to do for fun outside of the classroom? LH: I’m based in New York, so I love getting to explore the city (particularly the food) all the time. But like most people, I also enjoy reading, napping, and watching bad TV. I wish I had a better and much cooler answer!